It’s Kloofing* the Nuy River Gorge! *Abseiling & Kloofing are internationally known as Rappelling & Canyoning… but well, local is lekker! · Small personal groups of 6 max. · No previous abseil experience needed. · No compulsory High Jumps! · Ideal for novices as well as the experienced. · Participants are required to sign an indemnity form, it’s a serious adventure! · Guided trips can be arranged to suite your needs. · You’ll need to organise your own transport to and from Simonskloof. · Advanced booking is essential – min. 3 people. · Kloofing/Canyoning season end of October – April only. 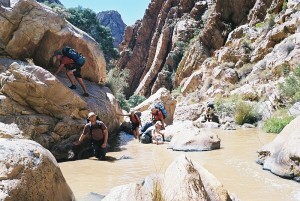 Starting at 08:00 hiking through Karoo & bush whacking and 4 abseils, boulder-hopping and swimming through remote rock-pools. Pick-nick lunch and snack is supplied. We’ll finish with a well-deserved ice-cold beer at about 16:00 – 18:00 depending on fitness of the group. We recommend that you stay overnight prior your trip, allowing yourself to arrive and soak up the scenery. There are several options available from camping to self-catering cottages. 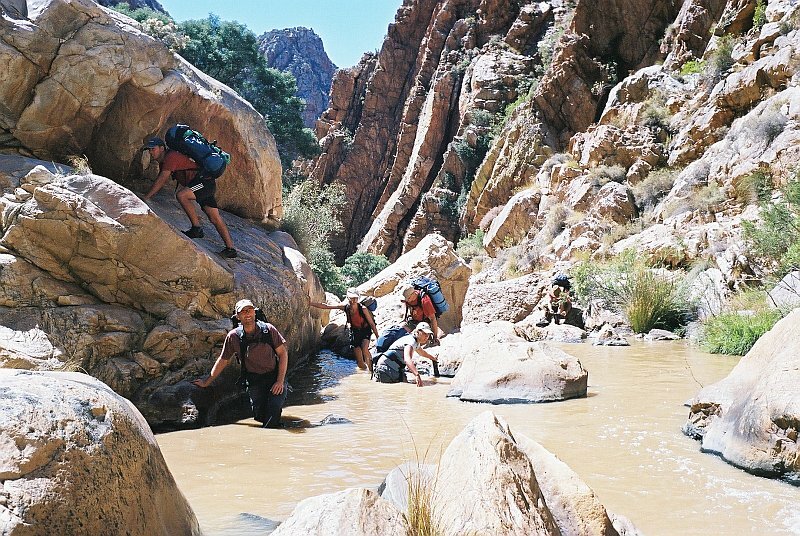 Day 1: We start at 08:00 hiking down the valley of Simonskloof through Karoo vegetation, then abseil and scramble down into the Nuy River Gorge. From there a long (sometimes icy) swim brings us to the overnight camp with potential of adventurous jumps into hidden mountain pools. Dinner is cooked on an open fire. Sleeping under the starry sky in bivouac style (No tent required). Day 2: After breakfast we’ll swim, then boulder-hop upriver and explore the many switch-backs and beautiful rock formations all the way to Keerom dam at the top of the Nuy River Gorge. By late afternoon ~17:00 we’ll be back at Simonskloof Mountain Retreat, for a well-done-drink. 1. Start on a Friday evening with a social and informative dinner, overnight in a self-catered farm cottage or camp here at Simonskloof Mountain Retreat. 2. Above guided trips are also available as self-catered options. The gorge is all yours: from the top down or bottom up. Choose your own kloofing route. Over night or it in a 1 day fast one. We’ll supply map and advice, you bring the rest: your own rope (60m), harness, helmet & food etc. Always check ALL waters before jumping into pools! This is an Adventure activity participants will be required to sign an indemnity form before hand. Participants join entirely at they own risk. Participants have to be medically fit, in good health and fair state of physical fitness. It is the responsibility of the participant to be adequately insured. In the event of injury, accident or illness, all costs arising including rescue service, airlifts, hospital fee’s, ambulance service, doctor fee’s, or any related medical expenses are solely the participants responsibility. The organiser, guides or employees cannot be held responsible for any injury, loss of life or damage howsoever caused. Visit us on Facebook for great pictures and our latest stories.